I find myself using Aroma Siez a lot lately. It is amazing for muscle cramps and soreness! The mixture of basil, marjoram, cypress, lavender, and peppermint combines to create a nice almost sweet smell. Basil is an anti-inflammatory and antispasmodic, which is great for muscle tension or head aches. Marjoram is another antispasmodic and it’s amazing for sore muscles, sprains, or headaches. Cypress relieves muscle cramps and improves overall circulation and may improve respiratory problems. Peppermint is the most commonly know topical analgesic, which helps alleviate pain and is amazing for headaches. 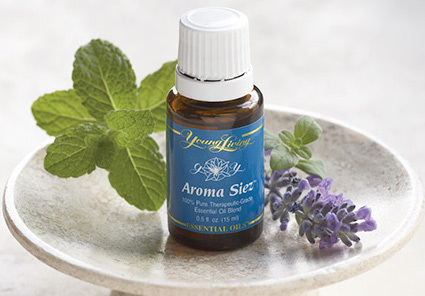 Lavender is the balancing oil that brings this blend to a comforting, muscle balancing blend. This combination helps to eliminate muscle spasms and tension. I’ve used it on acute injuries, chronic tension, and muscle soreness. It’s good for just after a work out in a bath or applying directly to your most sore muscles. It can also help with arthritis pain and most headaches.